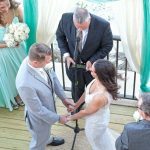 Terrence Tuttle & Suzanne Buksar had a beach wedding in New Smyrna Beach on 8/17/16 at a private rental house near Beachway Ave. The New Jersey couple also held a small reception at the house, which was catered. Suzanne really planned beautiful colors and decorations as shown in the photos. A custom sign was made and the seating was in a “circle or love” all the way around the arch. This was truly a unique setup and wedding for us. 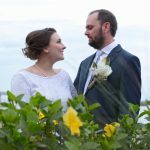 The couple chose the Maya four post bamboo arch with 24 chairs in the round, tall tiki torch aisleway, sand ceremony, welcome table and ceremony music. They hired a family photographer but we were able to shoot some photos for our records!